Cryptocurrencies and Basic Income: What is SwiftDemand? SwiftDemand is a basic income blockchain experiment in which each user who is signed up daily receives a certain number of Swift tokens. The project’s white paper gives a clear understanding of the implementation of this Decentralized Autonomous Organization (DAO) providing Universal Basic Income and how the Swift Protocol works. Citizens – The registration to become a Swift Citizen is open to anyone and is for free. However, a unique individual should only be allowed to have one account that receives the basic income and is validated by an Identity Provider. Entities – There are accounts not tied to individuals and are allowed to exist for business or privacy purposes. However, these do not receive any basic income. Delegated Nodes – these are responsible for maintaining full nodes, containing every single transaction that has occurred on the blockchain, and for creating new blocks for the tokens. Delegated nodes are elected by Swift Citizens, and the elections occur every 6 months. Identity Providers – These ensure the validation of the Swift Citizens identity, create new citizens by generating a key pair, i.e. a public and a private key allowing to encrypt information that ensures data is protected during a transaction, and include the identity on the blockchain. 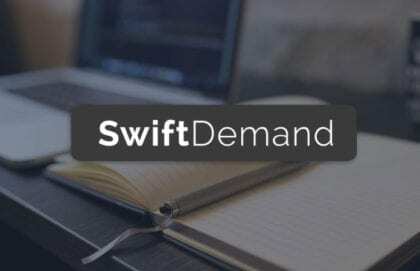 As specified by SwiftDemand creators, the goal of the Swift protocol income distribution is to provide a faire method of providing Swifts to all Swift Citizens. Swifts are distributed on a daily basis under the form of a basic income and, today, the grant is set at 100 tokens. However, it is subject to change as the amount of tokens distributed depends on the number of Swift Citizens that exist in the ecosystem. It is also important to note that the basic income has to be claimed by the Swift Citizens with a maximum of seven unclaimed days of Swifts. For example, it means that if a Swift Citizen claims its basic incomes every four days, he will be granted 400 tokens every four days. Another way to earn Swifts is through referrals program. When any Citizen successfully introduces a new user to SwiftDemand, his/her account is granted with 500 tokens. This attempt at implementing a universal basic income has the potential to make basic income more visible. Despite a complex protocol, the platform is free and easy to use. Even though the Swift currency does not have any value outside the Swift ecosystem, citizens have the opportunity to sell goods and services, transfer their tokens or make purchases, creating a parallel economy ruled by basic income values. Article reviewed by André Coelho. Quentin Mathys has written 2 articles. very interesting I wonder how the $ backed global sdr corrupt legarde from imf will take to these ideals? Interesting innitiative. I made an account in ten minutes!. 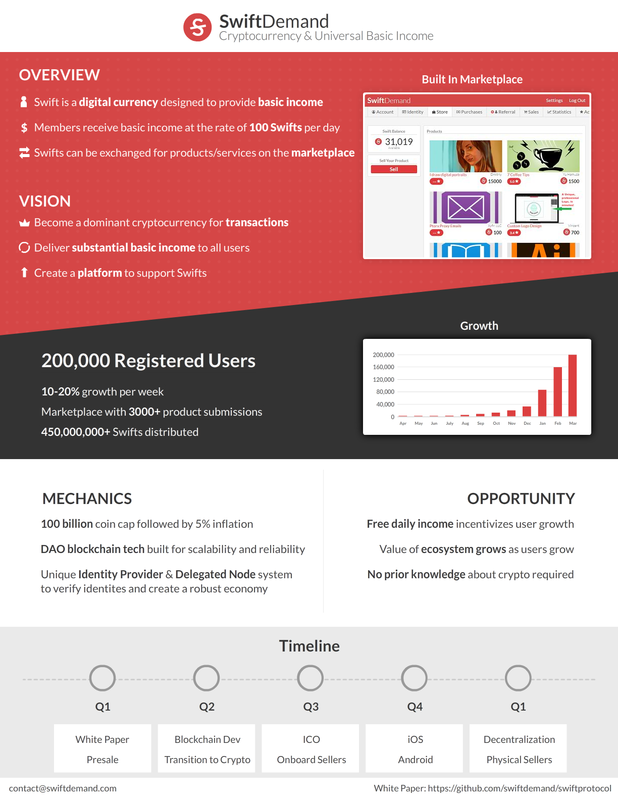 I hope more people gets involved in the marketplace so participating is more attractive. Did you provide your mobile number and your government issued ID? SwiftDemand is a carbon copy of basic income.network. I get warnings from multiple browsers saying that they are either website is not secure. Have you all taken a close look at them?